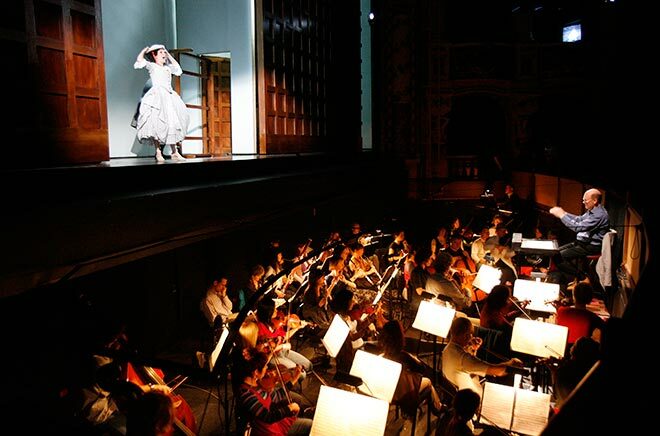 The Vector Wellington Orchestra (later renamed Orchestra Wellington) is shown in the orchestra pit at the St James Theatre, Wellington, playing for a New Zealand Opera performance of The marriage of Figaro. In 2011 the orchestra filed for a judicial review of Creative New Zealand's funding framework after fears that its annual budget would be cut by half. The legal challenge was withdrawn when it became clear that funding was not going to be affected, and the part-time professional orchestra continued to be part of the Wellington arts scene, accompanying ballet and opera performances as well as presenting a subscription season.